Navigation: Home » Economics » How Much Do Early Retirees – Or Extremely Early Retirees – Have Saved? How Much Do Early Retirees – Or Extremely Early Retirees – Have Saved? In this post, we’ll look at early retirees – and some of their extreme early retiree counterparts. How much do they have saved for retirement? How do they differ from the general population? Let’s find out using the 2017 Federal Reserve Survey of Household Economics and Decisionmaking. The SHED has two ways to classify adults as retired. There isn’t, of course, 100% overlap in those designations. In this post we’ll look at people who have self-selected as retired. One of the questions on the survey also asks when a respondent retired. For folks who answered, we’ll use that to classify extreme early retirees (40 or younger) or early retirees (56 or younger). … We’re with you! That’s not what we were expecting from the responses. In fact, it’s even the opposite of what we expected to see. The exact question text is, “What is the approximate total amount of your household’s savings and investments?“. Before you ask: this wasn’t a question about strict retirement assets. It also wasn’t a question about how much they had when they retired. Maybe they spent it down before this survey, they are already retired. The next section might shed some light on that possibility. In the last section, we used a person’s reported age of retirement to look at the differences in savings among retirees. And once again… a head-scratcher! The Savings of Early Retirees: Unexpected? As you look at more expansive retirement populations and older populations, the savings amounts increase. 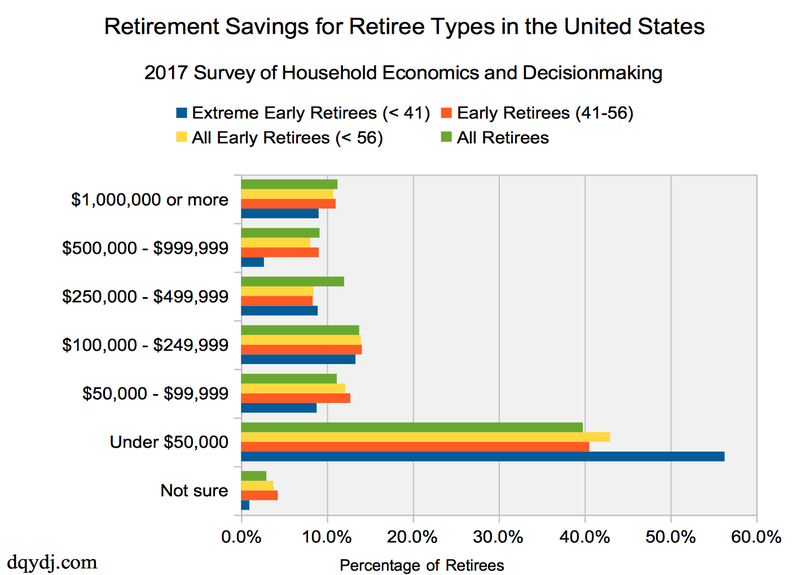 When sitting down to research this post, we predicted early retirees and extreme early retirees would have more resources saved than older retirees. Earlier, research showed how important Social Security is to retirement age: if people are waiting out Social Security, we thought their assets would be lighter in retirement since they could lean on a reliable stream of income. That, obviously, does not show up in the data! Are the early retirees spending their resources quickly? Have they calculated their needed savings down to the cent? Are some savings an investments misclassified? Are some early retirees – as theorized by many of you readers – mis-classified or “inappropriately” self-declaring in-retirement? Were we expecting the wrong thing going into this post? It’s tough to say what’s happening here. We know wealth is out there (see our net worth by age calculator for examples). Do you have a theory based on what this data is showing? Along with this post we have a few more on retirement. We looked at the early retirement age (and the extreme early retirement age), as well as survey data on how common early retirement is. We also looked at how the population of American retirees pay for retirement. Could it be forced retirement due to health or other concerns driving the results? Maybe some – but we were encouraged back in this post looking at retirement reasons: https://dqydj.com/why-do-americans-retire/ . While some people do seem to retire involuntarily, a majority are voluntary. Maybe the people you managed to filter into are the much discussed prime working age individuals not in the labor force. The fed has been saying for a couple of years now that the opioid addiction epidemic is really bad, even bad enough to show up in macroeconomic data. I could also see the critically/terminally ill being on this list, but how many people could those two groups amount to? Does SHED collect information on income from annuities like long term disability insurance? Maybe we could cross check against the population currently on SSI disability as well to explain part of it. I think your analysis ended up answering a different question than it set out to. Originally, the question asked was essentially “who are all these early retirees,” but what we got instead was who they are not. These people aren’t the super savers, or the idle rich. Maybe knowing who they really are can help drive policy changes to support an improvement in the labor force participation rate. Should we be spending more on medical research to get a sort of return on investment of an improved labor force? Or would more mental health services be the silver bullet? Maybe it’s our incarceration policies, or the stigma that follows those people the rest of their lives for making one mistake 30 years ago. No matter what the answer is, I think it is a lot more interesting than just filtering into the super savers or idle rich, because this result implies there is action to be taken to get better. There is a series of questions on “did you earn money from _____”. Looks like we have “Wage/Salary”, “Self-Employment”, “Side Work”, “Interest/Dividends/Rental Income”, “Social Security”, “SSI”, “Unemployment Income”, “Pension Income”, “Any Other Income”. Then, a separate question with total income (in categories) over the last 12 months with yet another question on Fed-classified income (PPINCIMP in the survey). There’s also a Fed-classified ‘Not Working – Disabled’. There are other questions on Medicare/Medicaid which have the disability qualifications – probabably something like youth + a ‘yes’ there could do something. What do you think about the above? Any good way to glue them together? Americans are (overly) optimistic. Not a bad thing in general, but not a good thing when it comes to retirement planning. Americans tend to live beyond their means (even in retirement). Unlike most other industrialized countries Social Security falls short of a livable retirement pension (it was not designed to replace a working wage, but many people fail to realize this or, optimistically, ignore that very important fact). That’s another important takeaway from this series – Social Security factors into so many decisions on this front. It basically dictates the most common early retirement age, and for a fair amount of people it’s their majority (and too often 90%+) income in retirement. I’m surprised the study stopped at “$1 million or more “. I think a lot of early retiring people are going to need more than 1$million unless they are very frugal. Interesting and disturbing data. It seems they asked people how much are in “savings and investments”. That might exclude other assets at least in some peoples minds. I also think that some of the people who classified themselves “retired” are likely not what most people would consider retired. Homemakers, people on long term disability, trust fund kids, etc. +1 on the second, the definition of retiree is definitely not consistent. I’m amazed by the number of people who retired with less than $50,000. How are they able to live from that? I’d hazard a guess that most individuals who are retired with less that $50,000 in assets also fall into the “no longer capable of work” category, rather than the modern meaning of the word retired. Yes, a pretty surprising number… From this series it’s become obvious that the definition of retirement changes a lot based upon who you ask.